In the tutorial Add a Simple List to an App example code was given to show how to load a ListView from a string array. This article shows how each list item in a ListView can display two lines of data, in this case each list item will be an American state and its capital. The two line list example in this tutorial also applies to a ListActivity which is simply an Activity with a built in ListView. A common pattern in Android is to define a View in XML, set up the data that will be displayed in the View, then provide the code to load that data into the View. In the case of a ListView (or ListActivity) the work is done by an Adapter. For a list with single line entries an ArrayAdapter does the job, as seen in the Add a Simple List to an App example. Adding another line of data for each entry in the list requires the SimpleAdapter. The code in this tutorial will define a two dimensional string array to hold the American States names and capitals data. Normally such arrays are read from a database or a web service. Two TextViews in a layout define the template for each two line list entry. The work of inflating the Views for each list entry and setting the values in the Views is done by a SimpleAdapter. 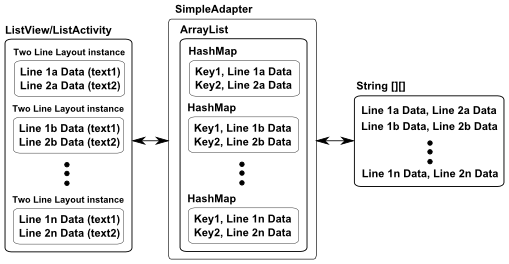 An ArrayList and HashMap ensures the data goes into the correct TextView for each list entry. This diagram summarises what the code achieves. For this tutorial a new project was started in Android Studio called State Capitals using an Empty Activity, all other entries for the Create New Project wizard being left at their default values. Under the java folder in the Project explorer tree open the MainActivity.java file (or whatever your named it). At the bottom of the class, just before the last closing brace (curly bracket), add a two dimensional string array to define our data. Here only a few values are shown, all fifty states are in the downloadable project code. Notice that the keys line1 and line2 are passed in as well as the View ids line_a and line_b. Linking the data to the Views. An example project is provided in two_line_listactivity.zip for importing into Android Studio. It is also available from the Android Example Projects page. Extend a two line list to three in Multi Line ListView Entries in Android. To read back the data from an item selected in the multi-line list see our article Read the Selection From a Multi Line ListView. There are more free Android Example Projects available. Ron on July 13, 2012 at 10:20 pm said: Very nice example, clear, clean, simple and more importantly, it works! It helped me out a lot. KUDOS! Marcel on December 9, 2012 at 4:49 pm said: Clear and simple tutorial, thank you! Tek Eye on December 9, 2012 at 11:30 pm said: Thank you. The declarations used are clear for less experienced programmers, particularly when calling the SimpleAdapter constructor, of course everyone can adapt the code to their preferred style. Refka on April 10, 2013 at 7:30 pm said: thank you but how to make it dynamic with json and php!! Tek Eye on April 11, 2013 at 8:34 am said: Use json_encode in PHP to generate the string array as a json object on the website. Use URL to make a HTTP request with HttpURLConnection to get the json object (INTERNET permission must be requested) from the App. Parse the received string directly or using the Java JSON classes to generate the string array for the two line list. Ana Maria on April 11, 2013 at 3:45 pm said: I would like to thank you for writing this tutorial. I am a newbie on Android and need to create and Android app for my final year project. You solved a problem that I had for 1 day now. With your help I was able to make progress in my project. The best tutorial ever. Anjith Sasindran on October 6, 2014 at 6:50 am said: Awesome tutorial man. Helped me a lot. All other tutorials are like creating a class which extends ArrayAdapter or BaseAdapter. This one is really good and simple to implement. Tek Eye on October 6, 2014 at 9:20 am said: Thank you for the comment. Enjoy your Android programming. pratik on December 8, 2014 at 11:08 am said: How to add onclicklistener in this list? Ankit Agrawal on February 17, 2015 at 11:02 am said: GREAT JOB!! Thanks. Mick on September 23, 2015 at 9:15 pm said: Thank you. Have looked all over for a simple example of this. Now I see just how simple it can be, and I am confident I can get it to work in my App.